A series of jade bottles made any time from the Kangxi through to the early nineteenth century are linked by imaginative use of brown-and-white pebble material and the use of chi dragons, which we believe may have been a feature of palace production, or at least production for the court. This is the reason for our very tentative designation of this as an imperial bottle, regardless of where it might have been made. The bottles represent less a coherent school of carving than a continuity of genius following the same impulse: to create a masterpiece of sculpture from the combination of a material and a subject that were both popular with the Qing ruling elite, and therefore, no doubt, with others as well. In this sale, lot 112 also qualifies as a member of this group. The two share the qualities of superb mastery of the medium combined with imaginative use of the pebble material, giving them a magical quality and extraordinary visual and tactile appeal. 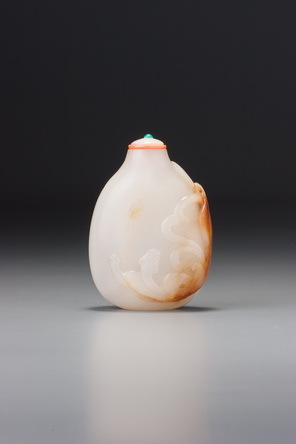 The original nephrite pebble obviously had a cleft in it that ran deep into the material, terminating in a jagged flaw filled with surface discolouration; the rich brown skin on one side of the cleft and the pure white material on the other side form a unique configuration whose sweep and curve inspired the artist to use it to great advantage to create a sinuous chi dragon, swooping down from the neck of the bottle on one narrow side and raising its head upwards low on the front of the bottle. This leaves the hindquarters, part of the tail, and much of the rest of the back and shoulders of the beast in a richly varied russet brown skin material in stark contrast to the white inner pebble, emphasized at the outer curve of its back by the jagged and deeply coloured flaw that delineates it. At first glance a tiny area of brown skin just above the dragon’s head might be taken for the ubiquitous pearl, but in fact the pearl is on the other shoulder, opposite the dragon, set in an irregular break in the clouds cleverly carved to incorporate a slightly grey-brown area of material. The artist has also chosen to make the typically feline head of the chi smaller than usual, thus emphasizing the powerful shoulders between which it is set and concentrating attention on the exciting and more dynamic carving of the line of the back and the natural flaws and colouring of the stone. Superb hollowing through a reasonably wide mouth and an impeccably finished, slightly concave foot surrounded by a narrow, even, and perfectly flat footrim complete the unusual flattened pear shape of the bottle. 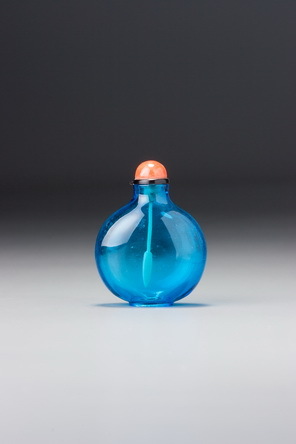 Like so many great snuff bottles, it is a masterpiece that comes to life ultimately only in the hand, where its entirely comfortable fit and the accompanying impulse to fondle it demonstrate beyond doubt that this is its natural habitat.